Defence Secretary Gotabhaya Rajapaksa Openly Supportive of “Ethno Religious Fascist”Organization Bodhu Bala Sena. In what seemed to be a harmless act in the public interest the Secretary of Defence and Urban Development Gotabhaya Rajapaksa has engaged himself in a controversial move that is likely to have far reaching implications. On Saturday March 9th 2013, the Presidential sibling regarded widely as the second most powerful man in Sri Lanka was the chief guest, ceremonially opening an institution linked to the Ethno Religious Fascist movement known as the “Bodhu Bala Sena” meaning Buddhist Power Force. The Defence secretary ceremonially declared open the Buddhist Leadership Academy of the Bodhu Bala Sena on Saturday in Galle, the capital of the Southern Province, referred to as the Ruhuna historically.The Bodhu Bala Sena’s Buddhist Leadership Academy is located in the Pilana area at Wanchawala of Galle amidst picturesque surroundings. According to the Bodu Bala Sena this Academy has been established to propagate leadership qualities in Bhikkus, Buddhist leaders and Buddhist activist youth.The Bodhu Bala Sena has announced that this academy would be developed into a full-fledged Buddhist University in the future. The ceremony was presided over by Ven. Pallaththara Sumanajothi Mahanayaka Thera. Among those who spoke were Head of “Meth Sevana”, Ven. Embilipitiye Vijitha Thera and General Secretary of Bpdhu Bala Sena Ven. Galaboda Aththe Gnanasara Thera. Declaring open an institution claiming to have such lofty aims and motives cannot be faulted under normal circumstances. Nevertheless there seems to have been doubts and misgivings beforehand about the Defence secretary doing so. This fact was revealed by Gotabhaya Rajapaksa himself while delivering his opening address on the occasion. Gotabaya Rajapakse at the opening ceremony said that although many had asked him not to participate on this occasion, he did so after realizing its timely importance. “These Buddhist Clergy who are engaged in a nationally important task should not be feared or doubted by anyone” he said. The Defence secretary’s glowing testimonial to the BBS and his frank acknowledgement of the objections to his participation at the event highlight the significance of the undercurrents in this exercise. The objections obviously were because of the Bodhu Bala Sena factor. 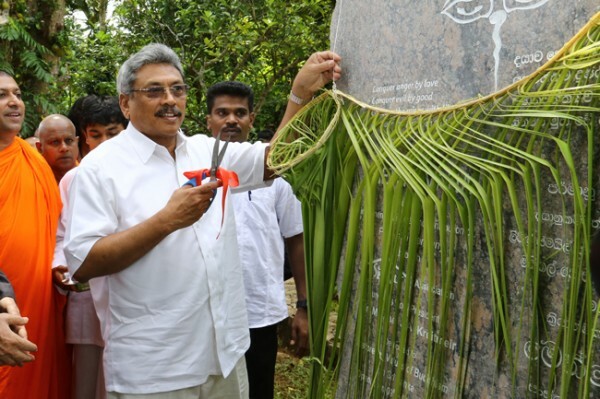 Earlier media reports had stated that Gotabhaya Rajapaksa was to be the chief guest at the opening of the Bodhu Bala Sena headquarters at Galle. The founders and leaders of the Bodhu Bala Sena movement are the Buddhist priests Ven.Kirama Vimalajothy Thera and Ven.Galagodatthe Gnasara Thera. Vimalajothi Thera is also the director of the Buddhist Cultural Center at Nedimala in Dehiwela.“Methsevana”the buiding complex at Galle was originally supposed to be an Educational and Cultural Center affiliated to the Nedimala Center. Subsequently Vimalajothy Thera being n charge of both the Nedimala center and BBS movement had changed the Galle Center into the Buddhist Leadership Academy of the Bodhu Bala Sena movement. It is also claimed that the”Methsevana” Building complex at Galle was the gift of a German national to the Nedimala Buddhist Cultural Center.Apparently the man owned the house and property that has now been converted into the BBS academy. If it was indeed a gift by the german national it is unclear as to whether he concurred with the decision to transform it into a BBS institution. The German national concerned was however present at the opening function though pride of place had been awarded to Gotabhaya Rajapaksa and not to the alleged donor. It is also interesting to note that while Vimalajothy Thera says the funds for the center at Galle was a donation from a foreign well-wisher he has gone on record stating the Bodhu Bala Sena does not get any foreign money. In an interview given to Ranga Jayasuriya of “Ceylon Today” Vimalajothy Thera says “ I can swear, even before the Buddha’s statue that we have not received a red cent from anyone. If anyone proves that we are lying, we would close our organization next day”. The participation of Gotabhaya Rajapaksa would not have been perceived as an issue if not for the notorious reputation and image of the Bodhu Bala Sena. The Bodhu Bala Sena(BBS) has been very much in the news lately for conducting a virulent campaign against religious minorities in Sri Lanka notably the Muslims of Sri Lanka. Notwithstanding denials by BBS office-bearers the organization has acquired a reputation in Sri Lanka and abroad of being a neo-fascist movement espousing the cause of Buddhist supremacy. The Bodhu Bala Sena along with some other groups aligned to it has been directly and indirectly responsible for an orchestrated well-organized campaign targeting the Sri Lankan Muslims in a manner that has attracted global attention and concern. The damage inflicted upon the Country and Government by the Bodhu Bala Sena inspired anti-Muslim campaign led many to suspect that a sinister extraneous force was behind these moves. Some even speculated that Israel was the hidden hand in this. While platitudes about Buddhist-Muslim unity were uttered and vague warnings were issued against those trying to harm this unity no specific reference was made to the BBS. Even as Muslims were assured that the Govt would not let any harm befall them no promise was made that those involved in an incitement campaign against them would be penalised under the law. When Muslim community leaders and representatives appealed to the President and Defence secretary they were told that the Bodhu Bala Sena was only a fringe group with miniscule support and that if action was taken against it that would make the organization a “hero” among Buddhists eventually leading to its growth and expansion. Calls to ban the BBS Rally at Maharagama on February 17th 2013 were also turned down.The Maharagama rally attended by mammoth crowds made a mockery of assertions by Mahinda and Gotabhaya Rajapaksa that the Bodhu Bala Sena was a fringe group without mass support.The crowds and the hostile mood at Maharagama suggested that the Bodhu Bala Sena anti-Muslim ideology was spreading rapidly among the people. Although it has not been admitted officially it does appear that the Rajapaksa Govt has complied with some of the demands made by the Bodhu Bala Sena.A notable example being the recent orders to discontinue permanent birth control methods for both Males and Females at Government and Private hospitals. The Bodhu Bala Sena has protested strongly against family planning for Sinhala Buddhists saying the community was shrinking because of this while the Muslim population was growing. The BBS specifically targeted the slogan and scheme “Punchi poulak Ratharang”small family is Golden) for Sinhala Buddhists. Another crucial factor is the role or non-role of the Police towards Bodhu Bala Sena activities. The Police which cracks down on peaceful demonstrations in many parts of the country when ordered to do so was not moving a finger against the Bodhu Bala Sena and its provocative demonstratons aimed at a minority community and its religion.The Khaki clad guardians of law and order who assembled in full strength to prevent the De jure chief justice Shirani Bandaranayake from going to the Supreme Courts at Hulftsdorph were acting like appendages to the BBS during demonstrations causing potential communal disharmony. In many instances the Police role was that of giving full protection to so called Buddhist activists to demonstrate safely without fear of a backlash from enraged members of the public. On several occasions demonstrations were conducted in an illegal manner amounting to foster disaffection among communities but the Police did not act. Even when images,placards and effigies deeply offensive not only to Muslims in Sri Lanka but also to those of the Islamic faith worldwide were displayed the cops did not react. Of course the Bodhu Bala Sena would deny responsibility for such offensive acts and attribute blame on other “copycat”outfits but the truth was evident to many. There have also been incidents where Police officials disgruntled with the Bodhu Bala Sena have confessed to trusted media personnel “off the record”that they were unable to take any meaningful action because of “orders from the top”. All these acts of omission and commission under the Rajapaksa regime have given rise to widespread suspicion that the Government was covertly encouraging and even sponsoring the Bodhu Bala Sena. Unlike the Jathika Hela Urumaya JHU) which is actively involved in politics the Bodhu Bala Sena says it will not get involved in politics.the BBS affirms full support for President Rajapaksa and calls the Govt a True Sinhala Buddhist regime. Against this backdrop several conspiracy theories have been floated as to how and why the Rajapaksa regime is involving itself with an ethno religious fascist organization like the Bodhu Bala Sena. Chief among these viewpoints is one where Defence secretary Gotabhaya Rajapaksa figures prominently. It has been alleged that the ex-Gajaba regiment soldier who is a devout Buddhist vegetarian is promoting the Bodhu Bala Sena and even financing it through a Secret fund under the Defence ministry. In the previously cited interview given to Ranga Jayasuriya by Vimalajothy Thera some of the questions asked relate to this. Q: Back to the previous question. There are allegations that the government is behind your organization?. A: We have not received any support whatsoever, from the government. The President did not even send a vehicle to take us to the President’s House for the meeting we attended some time back. Q: Not even from Gotabhaya Rajapaksa? He is an ardent Sinhala Buddhist?. A: No, I told you we have not received any support from anyone. We have not received any help from the Defence Secretary. What he told us was, “Hamuduruwane, please don’t create trouble.” I told him we do not create trouble and that he or anyone in the government should not worry about that. A: Some have said that the Defence Secretary is giving us money. Some others have said we are receiving funds from Norway. I can swear, even before the Buddha’s statue that we have not received a red cent from anyone. If anyone proves that we are lying, we would close our organization next day. I owe Rs 240 million to banks for a loan I obtained to renovate the Sambuddha Jayanthi Mandiraya. It is the vehicles of my Bauddha Sanskruthika Madyasthanaya that are used for our work. I myself authored Dhamma books and printed them with the help of Buddhist philanthropists. Q: Are you sure that you have not received any funds? A: Yes, we have not got a red cent from the government, any country or any NGO. We are planning to initiate a membership drive and collect a membership fee. We plan to recruit 100,000 persons, both lay and clergy members by the end of the year. Despite these strong denials the suspicion of a Gotabhaya Rajapaksa – Bodhu Bala Sena nexus continues to linger among significant sections of Sri Lankan society.These doubts have been further fuelled by media speculation of an “Israeli Connection” in the rise of the Bodhu Bala Sena. What would have been expected of any Govt that did not have links to an outfit like the Bodhu Bala Sena was for it to issue a public statement disassociating itself with the BBS. It would have been great had the President or Govt criticized the Bodhu Bala Sena for its anti-Muslim campaign openly. But this did not happen and is unlikely to happen under the Rajapaksa regime. Likewise the Defence secretary also could have clarified his position vis a vis the Bodhu Bala Sena and denied any links or connection to an organization that is regarded as neo fascist if he really had no connection. Instead the Defence secretary has chosen to associate himself openly with the Bodhu Bala Sena by participating in the opening ceremony and declaring open its leadership academy. By doing so he has sent a clear message that he does not care about being linked to the BBS. The positive comments he makes about an organization like the Bodhu Bala Sena clearly indicates his mindset on the charges made against the BBS.By his action Gotabhaya Rajapaksa has shown that he does not disapprove of the campaign condicted by the Bodhu Bala Sena. Many rationalizations and justifications would be made in due course by those seeking to defend the Defence secretary for adopting this ill-advised move. In a sense Gotabhaya Rajapaksa is perhaps being true to his character in identifying himself openly with an organization like the Bodh Bala Sena.He is demonstrating that he does not view the BBS negatively and is willing to stand up for his beliefs.Instead of engaging in words the man of action shows through this act the blatant disregard and disrespect he has for those affected by ethno religious fascism. Whatever the reasons for this move it would only strengthen the suspicion of a Gota-BBS nexus. This would reflect badly not only on him but also his brother the President and the Government headed by Mahinda Rajapaksa. Gotabhaya Rajapaksa declaring open the Bodhu Bala Sena Leadership academy in Galle is a seemingly trivial act but the consequences of this action would be felt and realized just as the full implications of the Mullivaaikkaal victory are reverberating in Geneva, Washington, London and New Delhi.